I love a surprise. And my daughter loves skirts. Happily for us, eclectic Melbourne boutique My Poppet loves both. Cinti, the devilishly clever and talented force behind the way-cool Caulfield South store, is stitching up a limited edition run of custom-made and designed skirts for little girls. Expect a little bit of frou-frou, a double-dab of nostalgia and a whole lot of vintage cool. 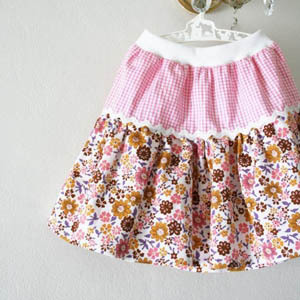 We love how every skirt is an original so they’re perfect for pint-sized princesses with a unique sense of style. And we love Cinti’s rules for ordering – you can offer some guidelines about which colours and patterns you like or loathe (as in “blue – yes; red – no; florals – blah” etc.) but that’s it. So, in Cinti’s own words, control freaks need not apply. 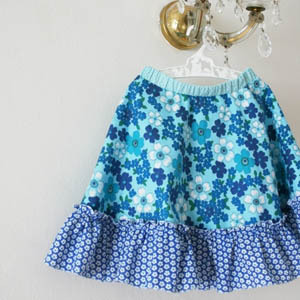 Cinti then selects the fabric and other features based on your basic design brief to create a very pretty, very girly skirt that will have your little girl giddy with excitement. My favourite bit is how you won’t know exactly what you’re getting until the skirt lobs in your letterbox. If you need more convincing, here’s a few skirts Cinti has already knocked up for other customers. Like what you see? 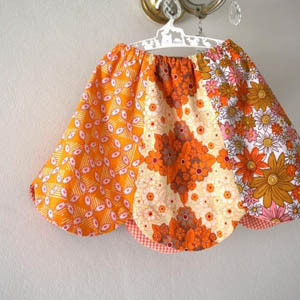 You won’t get one exactly like these because each skirt is an individual work of art. But you better be quick. 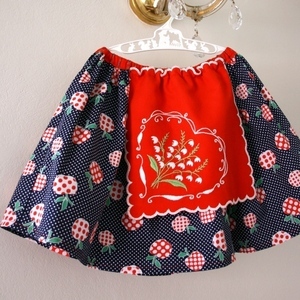 Cinti only has enough vintage fabric left to make ten more surprise skirts. They cost $45 each and will take up to four weeks to make, with postage extra. To place an order, visit My Poppet.